Notes: This is a pattern designed by Ed Schroeder of Fresno, CA in the early 1970's. Ed's homewaters are the King's River of the Sierra Nevada. 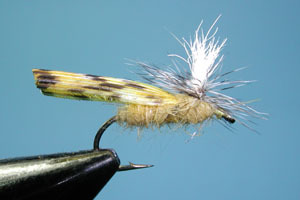 Ed applied a calf hair wingpost to not only hoppers but ants, hare's ear nymphs, and caddis patterns. These patterns were picked up by Umpqua Feather Merchants and have been marketed throughout the Sierra Nevada region as well as most of the United States. The White Calf Hair parachute makes this hopper very visible so that you can follow the drift. He suggests keeping the wingpost no more than one half the shank length so that the hopper is more streamlined for the windy conditions which you are often encounter preceeding the use of the fly. The parachute also makes the fly a usefull indicator with a nymph dropped below it. 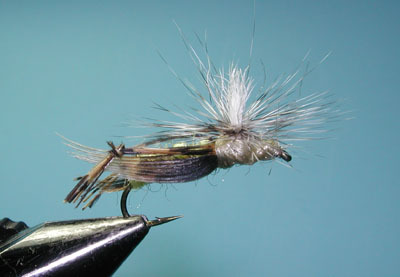 It is also interesting to note that Ed's pattern is perhaps the only major hopper pattern devised by a West Coast fly tier. Hopper patterns have been around a long time, even noted in the manuscript of British angler, Joseph Cotton in 1676 "The Compleat Angler". Hoppers were often given as an afterthought within the United States until the early 1940's when Art Winnie developed the Michigan Hopper (later Joe's Hopper) , followed by Ernest Schwiebert's Letort Hopper, and Dave's Hopper (Dave Whitlock) in the 1950's. 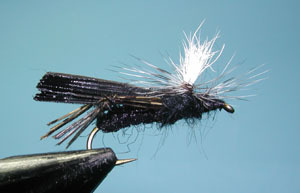 Mike Lawson's Henry's Fork Hopper was developed from Bill Bennett's Pontoon Hopper which was popularized in Vince Marinaro's book, "A Modern Dry Fly Code". 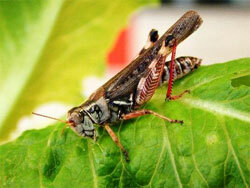 Variations of this pattern often change with wing and body color to represent Golden Stone's and Crickets. Other pattern variations use antron dubbing for the thorax, foam abdomen's, Ringneck Pheasant Window feathers for the wings.